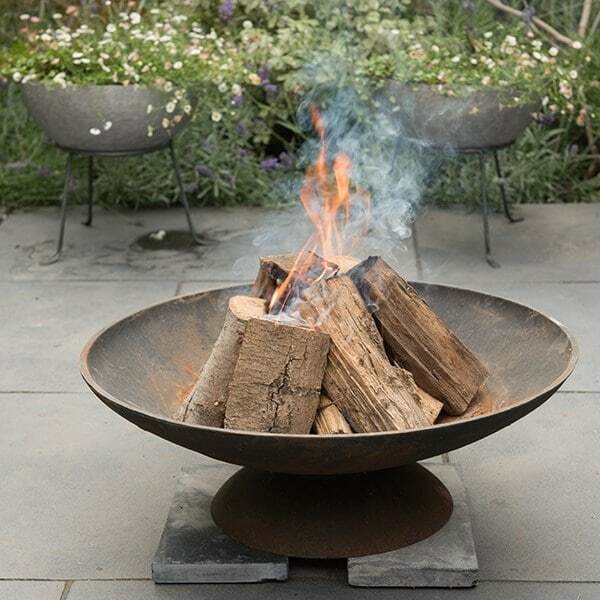 Buy Cast iron disc fire pit: A magnificent cast iron bowl with a simple design, which will hold a good sized fire. It is made from really thick and heavy cast iron, so although it will show some signs of rust if left outside, it will never rust through completely. The black paint finish will burn off, along with any small spots of rust which will develop, but this bowl is built to last. It comes in two pieces (the bowl and the stand), which will easily fit together with the screws supplied. Suitable to use with either wood or charcoal.<br><br>This brazier can also be used as a barbecue by purchasing the accompanied grill and cover.<br><br>Measurements:<br>Ø60cm x H20cm (including stand)<br>Weight 12kg<br><br><b>Warning:</b><br>For outdoor use only. Keep children and pets away from the brazier when lit. Always position away from buildings on a safe non-flammable surface. If using on a paved patio, place on an additional protective paving stone made from solid natural stone or concrete at least 5cm thick. This will avoid possible discolouration and cracking of your patio, as some mock slabs made from resin or ceramic may be susceptible to heat damage. Only for use with logs or charcoal. A magnificent cast iron bowl with a simple design, which will hold a good sized fire. It is made from really thick and heavy cast iron, so although it will show some signs of rust if left outside, it will never rust through completely. The black paint finish will burn off, along with any small spots of rust which will develop, but this bowl is built to last. It comes in two pieces (the bowl and the stand), which will easily fit together with the screws supplied. Suitable to use with either wood or charcoal. This brazier can also be used as a barbecue by purchasing the accompanied grill and cover. An attractive addition to our new garden. Bought as a gift for my husband. We all love it and have spent so many happy evenings in the garden, chatting by the fireside with a glass of wine or toasting marshmallows with the children. Best present I have ever chosen. Lovely quality and simple design. 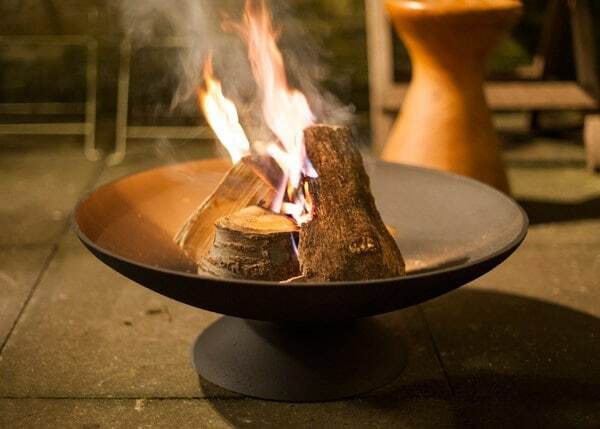 This product was bought as a Christmas present,I and the recipients were very happy with the fire bowl. HI, is there a drainage hole in the bottom on the bowl? Please could you tell me if you can use charcoal with this brazier? Hello, Yes, you can use either wood or charcoal with this brazier. 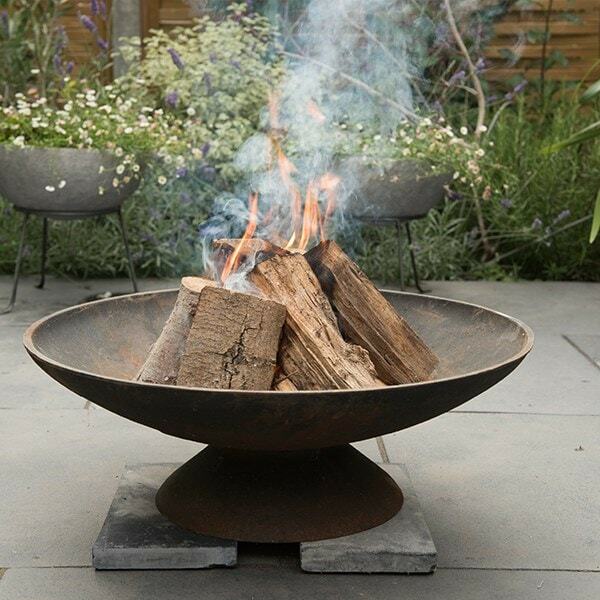 I've seen the cast iron disc brazier in small and large, do you have a medium? Does the stand allow this to be positioned on a wood deck? Hello, If the fire is lit for any length of time, some heat will transfer down into the base, so I would recommend standing this on something like a paving slab to make sure it is safe. Hi. Can you tell me if this will rust. I've seen other fire pits made out of steel and they completely rust and look cheap and flimsy. However as this is cast iron I'm hoping it won't. Hello, This brazier is built to last, so although the black paint finish will burn off and it will show some signs of rust if left outside, it will never rust through completely. it states this is 20 cm high is this on the stand or with out it ? Hello there The height of the Cast-iron disc brazier including the stand is 21cm. Hope this helps. Could you tell me what the weight of this brazier is please? Hello, This brazier weighs approximately 25kg.